When we talk about the Golden State Warriors, the discussion often centers on their scoring prowess—as it should. They are one of the best offensive teams in recent history and average an NBA-best 117.6 a game. But lost in those discussions is how good the Warriors can be on the defensive end of the court. Their defensive skill was certainly on display Thursday night against the Indiana Pacers. It was their first game at home since getting embarrassed by the Phoenix Suns earlier this month. They had gone 3-1 on their four-game road trip including wins against two other playoff-bound teams, the Houston Rockets and Oklahoma City Thunder. It was also the first home game for the newly-signed Andrew Bogut. Both teams started out with substantial defensive efforts. As a result, at the end of the first, the game was tied at 19-19. The game remained close for most of the second, but in the final minutes of the quarter, the Warriors started to pull away. At the half, Golden State led 53-43. When the second half got underway, the Warriors started up right where they left off. 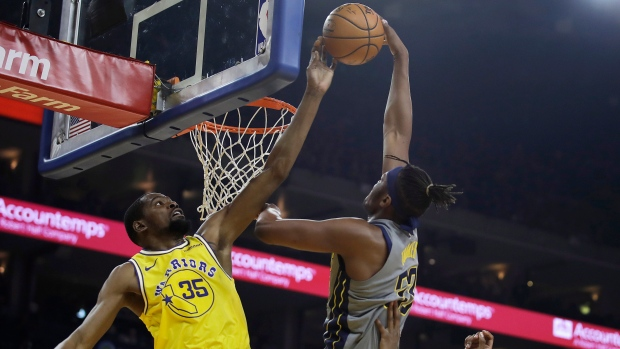 Golden State’s defense continued to frustrate the Indiana offense while the Pacers defense had no answer for the Warriors. Consequently, midway through the quarter, the lead was up to 21 for the Warriors. As the quarter came to a close, it had settled at 16 points, 88-62. Indiana never really threatened in the fourth as the Warriors went on to win 112-89. It was the second time in four games the Warriors defense held an opponent to less than 90 points (Oklahoma City scored 88 last Saturday). No one had an exceptional day on the offensive end for the Warriors. But for the fourth time this season the entire starting five scored in double figures. DeMarcus Cousins made his return after missing the last two games with an injury to lead the way with 19 points and 11 rebounds followed by Klay Thompson with 18. Steph Curry and Kevin Durant chipped in 15, and Draymond Green had ten. After going 1-10 from three-point range in the first quarter, the Warriors finished 13-36 from behind the arc. As for the Pacers, Indiana just couldn’t get anything going on the offensive end of the court. Tyreke Evans ended up leading the team in scoring with 20 points coming off the bench. Their bench ended up outscoring the starting five, 53-36. Six players scored in double figures as the Dubs protected home court in last night's victory. The loss is the fourth in a row for the Pacers and makes it highly unlikely they catch the 76ers for the No 3 seed in the Eastern Conference (they are 3.5 games back with nine games left in the regular season). However, they will need to be concerned about holding onto the No. 4 seed; they have just a half-game lead over the Celtics. The Pacers return home to face the Denver Nuggets Sunday night. Golden State will go for win No. 50 when they face the Dallas Mavericks at home Saturday night.